This is my only 1 star review of a Paizo product. So I feel the need to explain why. Mythic Adventures is a based on a great idea. Instead of restricting epic play to (say) characters after level 20, create a mythic system that runs orthogonal to standard level advancement, and which allows players to do things and explore themes not allowed by the standard ruleset. --1. Provide new mythic abilities which provide plot hooks, inspire the imagination, and suggest ideas for various campaigns or adventures. --2. Provide new mythic abilities which allow players to do qualitatively different kinds of things than the standard ruleset allows. --3. Avoid positing many more mythic abilities that boost offense than defense. --5. Avoid positing abilities which do little other than boost the numbers into the high-level regime where the D&D 3.5 and Pathfinder math breaks down. --6. Avoid adding abilities which add new sui generis ways of making the game rocket-tag like, by adding yet more "I win"-types of abilities (either by themselves, or in combination with other Pathfinder material that's been published elsewhere). It's not all bad. As I mentioned, there are a handful of mythic spells that feel epic and are plot-hook inspiring, and the book offers some tools for DMs to use to make opponents more deadly. But on the whole, most of what's in this book is best avoided. This book presents an excellent way, which I think worked better than 3.0-3.5's epic system, to allow for the truly legendary and heroic heroes of the world. Think less Aragorn and more Beowulf. In general it is a fine product and I don't recommend against getting it. That said though I found it flawed in two ways which, while they've occasionally crept up into other PF/Paizo books, I think need to be noted. 1) Balance issues. To some extent when you discuss epic you're throwing that out the window anyway but this book, more so than even other books like the ARG or what the Ultimate series offered, needs a GM to keep an eye on what's going on. I wish it had undergone more play testing but I think this might just be an inherent issue at this power level. When you start multiplying character power as a DM you need to be ready to regulate that. 2) Print quality. The bigger issue I had. I've tried to physically own this book 4 times now. Twice from game stores in two different states and twice from a credible online store. In all four cases I found inking issues on some of the artwork, 3 of the times on the same few pictures. This is problematic because one of the biggest reasons to get the printed book and not just use the online info for free is the artwork. I am about to try and buy it again now, hopefully it's on a later run at this point and that's been fixed. That said, if you buy it and care about the artwork make sure to look at the larger pictures in the book and make sure they aren't faded or have streaks at any points. In summary though, I want to make it clear that for it's price it's not a bad book. I'd give it a C++ or B-, it won't be something you regret (especially if you don't care much about a few images being a little off). 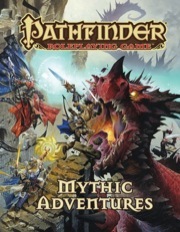 It was a good, and unique, Paizo/Pathfinder book just not one of their very best. I was thrilled at the concept of this book. Sometimes the story, the characters, need to step up to a more rareified level and really bring the oomph and this book provides the oomph. 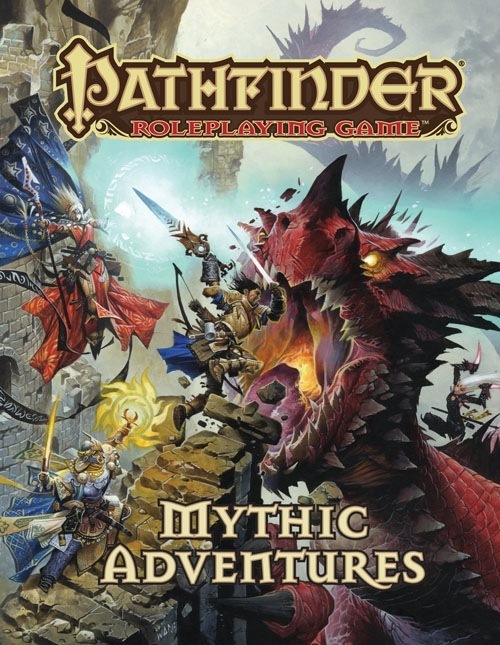 I especially love some of the little pieces added therein that make a mythic adventure less roll-play and more role-play; the concept that mythic power can simply go away, that the leveling of tiers is solely up to the DM, that in fact much of the advancement and introduction should be story-based. But for what I didn't love. 1. The powers offered are wildly inconsistent in effectiveness. I don't mean powers that are taking for a roleplaying reason. I mean powers that are obviously crunch-based when compared to another crunch power and you cannot fathom how one is supposed to anywhere near equal another. The same with the feats. 2. The very limited scope of mythic paths. I get that this is the intro book and we cannot get a ton of paths right off the bat, but really, six paths? Only 37 pages of path descriptions and powers out of 250+ pages? I've played more characters that wouldn't fit into these paths thematically than would. 3. Mythic monsters takes 57 pages and could have been done in 10. Paizo has been awesome about not reprinting crunch from one book to another, really guaranteeing the value you get in a book. But the monsters presented are basically mythic versions of creatures we all know already. And the mythic build rules for creatures are simple enough (a good thing!) that all we really needed was one example. So, I like the idea, was a little less than thrilled with the execution, but I am awaiting more. Here is why I like it. The system is so flexible that a GM can attach the rules to his or her game anywhere, anytime. Additionally, said GM can pace advancement to fit his or her campaign. Want PCs that are only marginally more powerful than standard PCs? Simply space or limit the number of trials. Walks like its mythic, quacks like its mythic. It's mythic. I really don't feal that this cover art makes me think mythic or anything close, kinda disapointing. Maybe if the dragon was covered in glowing runes or had a halo of light around it. This book and Ultimate Campaign have not convinced me to reniew my subscription to this line anytime soon. With monsters included, how big is this book? "Look, I'll give it back once we get Alain out from inside the dragon." Will there be art for all the Mythic iconics or just some of them? Wonderful cover! I love seeing the classic iconics too. Great looking cover. Too bad the tarrasque wasnt the enemy. Does appeasing the volcano involve Dave Chappelle? Can I assume the book's spine is Gold Leaf? What Campaign Setting book will accompany this? I love that sword that Valeros has! What is the name of that sword? Tarrasque would have been cool for the cover. Paizo (I believe specifically JJ) have said elsewhere that they prefer to keep the Tarrasque as the pinnacle creature for non-mythic play. I can't wait for this, even though I likely won't get to use most of the stuff in this book the material alone is worth having for planning and plotting. "Over 40 mythic monsters to challenge your characters, focusing on creatures from myth and legend like the mythic minotaur and mythic medusa." I'm hoping that there are some monsters that are new as well. I'd hate if it all 40+ monsters were just regular monsters from the previous Bestiaries with mythic tiers thrown onto them. it has to be released that month as the first part of the Mythic rule using AP comes out. and you can't run such an AP without the necessary rulebook to go with it. I have heard that they're mining a few of the SRD epic monsters, which would be new to PF. Kinda like how many creatures in the bestiaries are updates of Tome of Horror monsters. At the very least, I recall hearing something about everyone's favorite deadfetusgod. But things may yet change. Darn. When I saw the cover I thought that this would be the Epic Level Playbook. This still looks fantastic though. Mythic is the equivalent of the first 10 levels of Epic play. It does it in a different style that is less about the classes the character has and revolves more around 1 or 2 of 6 archetypes that act as a sorta catchall for the different classes and ideas... it's epic play but not with the same rules as the old ELH. Actually its more accurate to state that mythic levels can act in place of epic levels but can be taken at anytime. their purpose is to both give players extra advantages and make the monsters much harder to kill(if done correctly). so it is more accurate to say that its an extra tier of difficulties and challenges above the normal level and not actually an epilogue campaign for your characters after level 20. cause once you reach your class level of 20, their is no going further except by mythic levels which end after 10 levels. Epic levels: 20+ class levels. Mythic levels: 20 max class, 10 max mythic. With this and ultimate campaign, you have gotten me to subscribe to the RPG sub. Looking forward to it! We didn't get a chance to test it until after the Playtest was supposedly over. That's an awesome cover. Mythic awesome. Exactly. "Mythic" and "epic" are like a Venn diagram; there's some overlap, but for the most part they're separate. @The dragon on the cover: "Hey little guy, did you lose your mama?" Great cover but what happened to the wings on the dragon? 40 monsters?!?! That is a lot! I sure hope there aren't all rainbow dragons of above ancient variants, that would be cheap. I hope they will be all advanced mythology monsters and atropals, sirrushes and Phane. I'm pretty sure that guy is the definitive example of Colossal plus, for those of us who remember/have the 3.5 Draconomicon. Actually I love the cover, and think its a brilliant play on the core rulebook cover. Same Iconics present, same dragon, but now everyone, including the dragon, is "Mythic Flavored" for your enjoyment. Like Ultimate Campaign this is going to be something I'll paw through at the local game store before I commit to buy. That said I might get Mythic Adventures to run a Hellenistic or Nordic Mythical Campaign. Say Jason and the Argonauts in Pathfinder Form? They both look useful, I just have to see the finished products before I commit to much more than careful optimism. I was saying that simply because Ultimate Campaign contains things that would be easier to implement. I hope prismatic dragon is in, but not Red Dragon Wyrm & Red Dragon Great Wyrm, also not Gold Dragon Wyrm and Gold Dragon Great Wyrm. In that way 20 spots would go to dragons. Cosmic dragon of some kind that looks like the night sky with stars. An elemetal that is made of air, earth, fire, and water. I think he means Cat-thulu, the harbinger of the apurrcalypse. Domains of Evil, Trickery, Animal (Fur), and Destruction (Catastrophe). Kaiju Template would be better.